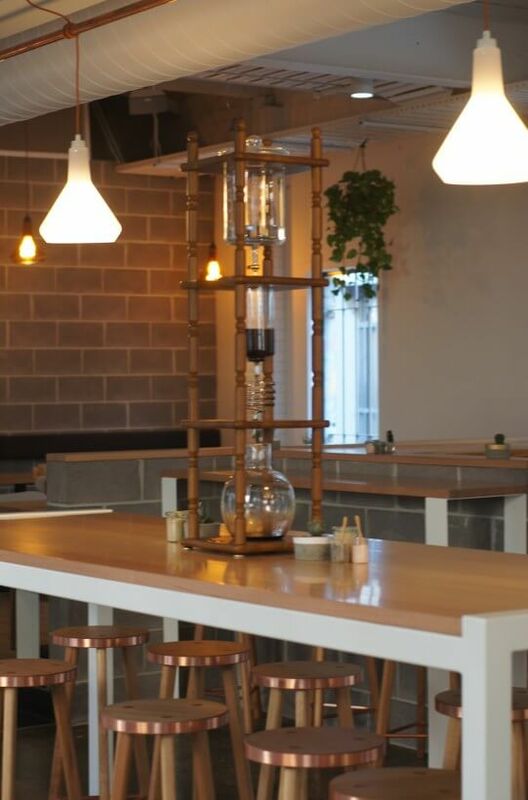 Sir Charles Fitzroy is the latest venture by the folks behind Axil Coffee Roasters and built on the site of the the former Beans and Bagels. Having been a customer at the previous establishment I am in awe of the transformation. Goodbye dated, dimly lit cafe, hello to light, blonde wood, pastel accents and copper stools. 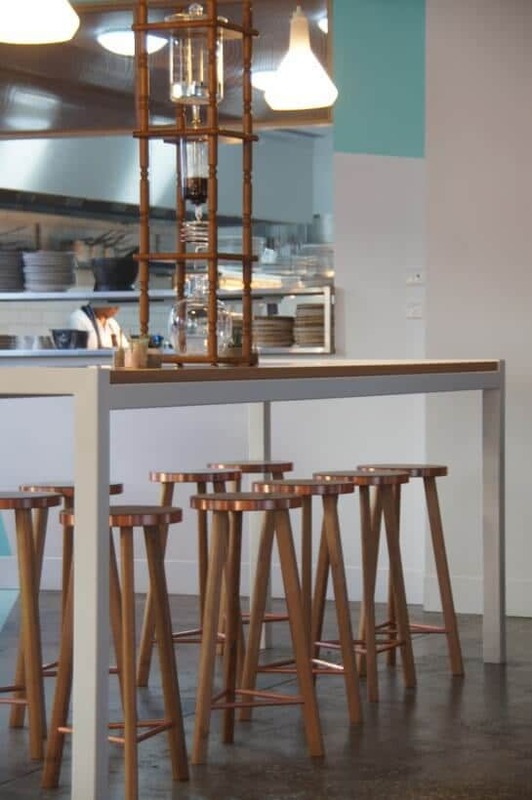 Oooh those copper stools. I just couldn’t stop taking photos of them! I have no idea how comfortable they are to perch on but they look amazing. Their brushed glossiness brings a sophisticated warmth to the high ceilings and expansive space which could otherwise come across as cold and cavernous. The daytime menu has an Asian flavour to it and I tried the BBQ pork belly with tonkatsu sauce, spring onion and fried egg roti ($17). Judging by the constant flow of this dish from the kitchen to diners I suspect this is one of their most popular items. 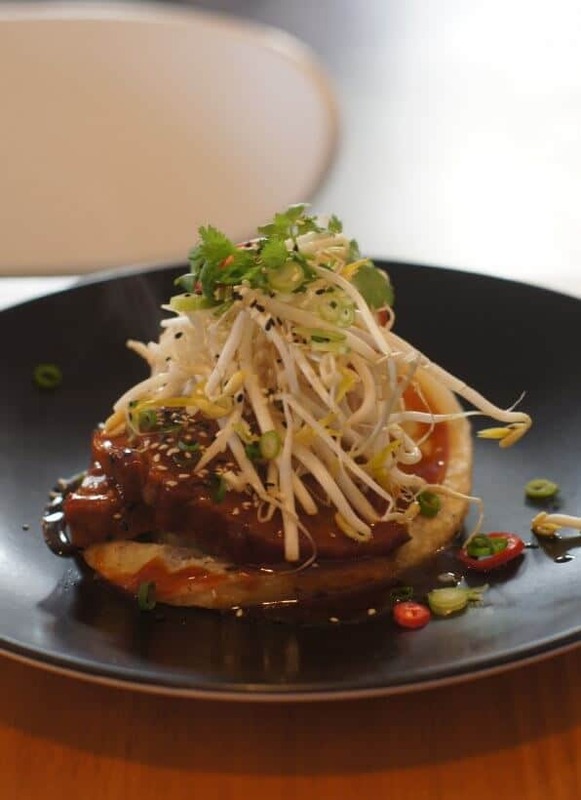 The pork was a melting slab of meat and fat and the crunchy bean sprouts and chilli helped cut through the richness. The fried egg was done perfectly so that the yolk was still runny on a gentle prod. I also tried the vegan toasted coconut crepe ($13.50). While I wasn’t expecting a French-style egg crepe I think they should specifically describe it as a glutinous rice flour crepe because not everyone enjoys its chewy, slippery texture. I, for one, love it, so I was very happy with the dish. I particularly enjoyed the slight hint of sweetness from the coconut and the pile of fresh fruit salad and butterscotch sauce. The rest of the menu is just as exciting and the friendly service and gorgeous decor will mean that it becomes a regular on the Fitzroy cafe circuit.